The two-year Associate of Applied Science Degree in Nursing at NOVA prepares students for a successful career in nursing. The curriculum is designed to prepare selected students for eligibility to take the National Council Licensure Examination (NCLEX) and a future career as a registered nurse (RN) providing and coordinating care for patients in a variety of healthcare settings. Note: The background check will not have to be ordered at time of application for the next application cycle. If accepted into Nursing, a background check will be required before entry to the program. Full-Time 5 semester program: first semester students take the pre-requisite course work to prepare for applying to the program. Lecture and Labs are held at the Medical Education Campus in Springfield, VA.
State of the art Simulation lab. The NOVA Nursing Curriculum is fully approved by the Virginia Board of Nursing (VBON), located at Perimeter Center, 9960 Mayland Drive, Suite 300, Henrico, Virginia 23233-1463. 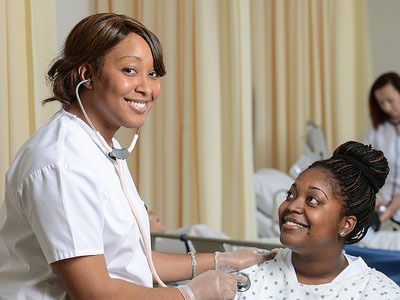 The Associate Degree in Nursing Program at NOVA is accredited by the Accreditation Commission for Education in Nursing, Inc. (ACEN), 3343 Peachtree Road NE, Suite 850, Atlanta, Georgia 30326. View NCLEX-RN pass rates for the last five years. The Nursing division is located at the Medical Education campus. It is led by an academic dean with an associate dean.